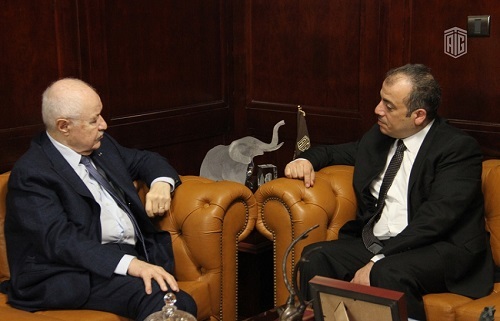 AMMAN - HE Dr. Talal Abu-Ghazaleh, chairman of Talal Abu-Ghazaleh Organization (TAG-Org), received in his office Dr. Nizar Haddad, General Director of the National Agriculture Research Center (NARC), to discuss cooperation in the field of Arab-Jordanian agricultural research development. The two parties also discussed ways for utilizing TAG-Org's technical capacities in the Center’s various relevant fields of expertise, mainly networking and connecting the Center with research centers in Europe, as well as archiving the Center’s national library and connecting it with the Arab Organization for Research and Education (ASREN). Dr. Abu-Ghazaleh expressed his admiration at the pioneering experience of NARC and the leadership of Dr. Haddad, through the Center’s new vision of adapting to new advancements, in addition to its by-laws and structure which enhance efforts to unleash innovative ideas and motivate scientists and researchers to conduct research that would ultimately be translated into patents and applied knowledge. Dr. Abu-Ghazaleh highly commended the Center for its use of solar energy at their premises and for the technical support they provide to farmers in this field in cooperation with the funding agencies in accordance with the Center’s plans to become completely dependent on renewable energy. Moreover, Dr. Abu-Ghazaleh called on other national institutions to adopt the same approach taking into account price fluctuations, noting that expectations about an upcoming economic crisis may lead to unprecedented increases in the cost of electricity. At the end of the meeting, the two parties agreed that TAG-Org would establish a knowledge station at the Center early next year, provided with training courses offered by Talal Abu-Ghazaleh Knowledge Society and Talal Abu-Ghazaleh Academy for Professional Training. Moreover, an agreement was reached to provide the Center with a free-of-charge Internet line provided by TAG-Org in addition to network routers, as needed, to technically connect the Center to ASREN.